Multiple sclerosis (MS) is an inflammatory disease of the nervous system that disrupts communication between the brain and other parts of the body, resulting in episodes of weakness, paralysis, blindness, and other symptoms. "She Played Like an Angel"
Jacqueline Du Pré was born in England in 1945. On her fifth birthday, her parents gave her a cello, and she started lessons the next year. At 16, Jacqueline made her debut in London and immediately became a household name. In 1967 she married the pianist and conductor Daniel Barenboim, and together the young, multitalented couple charmed the musical world. Six years later, Jacqueline could no longer feel the strings of her cello. By the mid-1970s, she was unable to dress herself or stand without help. In 1987, at the age of 42, she died of the disease called multiple sclerosis. Many people with MS are mildly affected, but in the most severe cases, like Jacqueline Du Pré's, a person may be unable to write, speak, or walk. Our bodies are able to act and react to the world around us thanks to a network of specialized tissue called the nervous system. This network is divided into two parts, called the central nervous system and the peripheral (pe-RIF-er-al) nervous system, which together process messages to and from all parts of the body. The basic unit of the nervous system is the nerve cell, or neuron, and humans have billions of them. Each neuron looks something like a kite. The top of the kite, or cell body, has many fingerlike extensions called dendrites that receive incoming messages. The tail of the kite, or axon, carries electrical messages from the cell over long distances. Dendrites and axons are called nerve fibers, and a nerve is a bundle of nerve fibers. Nerve cell fibers are wrapped (or sheathed) in a protective fatty substance called myelin (MY-a-lin). MS is an inflammation of the nerve fibers in the brain and spinal cord that results in scarred patches called plaques on the myelin sheath that protects the axons and dendrites. When plaques form, the signals passing through the cells may slow down or stop completely. Recent research suggests that, in addition to damaging myelin, MS sometimes slices through the nerve fiber; in other words, it destroys the neuron. About 1 million people worldwide have MS. The disease mostly strikes young adults between 20 and 40, and it affects about twice as many women as men. No one knows what causes MS, but it is believed to be an autoimmune disorder, that is, an attack by the body on its own cells. A healthy body is continually primed to defend itself against disease-causing invaders such as bacteria, viruses, fungi, and parasites. The collection of techniques the body uses to resist disease is called the immune system. Usually the body is able to tell its own cells and foreign cells apart. But sometimes the mechanism for distinguishing self from non-self goes awry. In MS, the body no longer seems to recognize part of the myelin, and begins to attack it. MS can follow several patterns. The most common type is called relapsing-remitting MS, in which symptoms come and go, sometimes with years in between when a person is perfectly fine. In about 50 percent of people with relapsing-remitting MS, the disease eventually will return for good, and when that happens, it is called secondary progressive MS. About 10 percent of people with MS have what is called primary progressive disease, which means that the disease does not go away after the first attack. Patients with primary progressive MS tend to be older (around 40 to 60 years old). A fourth and rare form of MS is called progressive-relapsing disease. Worldwide, about 26,000 people died of multiple sclerosis in 1998 and about 1.5 million people have the disease. MS is more common in regions far north or south of the equator, like the northern United States, Canada, Scandinavian countries in Europe, and South America. No one yet knows why. As many as 350,000 Americans, or 1.2 percent of the population in 1999, have the disease, according to the Multiple Sclerosis Society. Many live 30 years or more with only mild symptoms. About 25 to 30 percent become disabled to the point where they need a wheelchair. Women get MS two to three times more frequently than men. Whatever causes the immune system to react in the wrong way in MS is a mystery. Some scientists believe that a virus causes the immune system to attack the myelin sheaths. Others believe that factors in the environment (temperature, for instance) may trigger the disease. Genes * also may play a role in MS. Generally a person's chances of getting MS are very low: less than a tenth of a percent. But if one person in a family has MS, then that person's parents, children, and sisters and brothers have a higher risk of getting the disease. To complicate matters, it seems that more than one gene is involved in a person's susceptibility to MS. In other words, many different factors are believed to be involved in MS. Research into how genes interact with one another and with the environment may help shed light on what causes MS.
What Are the Signs and Symptoms of MS? MS may begin very dramatically, or the symptoms may be so mild that a person barely notices them. In the early stages of MS, people may find that simple motions like opening a window or climbing a few stairs tire their arms and legs. Feelings of numbness, or of "pins and needles," are common. Patients often experience blurring and double vision. A person may become uncoordinated. In 70 percent of patients with MS, many of these early symptoms disappear, only to reappear months or years later. Over time, a person may become completely paralyzed. Many patients with MS have frustrating problems related to urination and bowel movements, such as incontinence (in-KON-ti-nens, the inability to control urination) and constipation. A person may become confused or forgetful owing to damage to the part of the brain that processes information. Some people with MS become depressed, or have fits of laughing or crying uncontrollably, for no reason. Sclerosis comes from the Greek word for "scarring" or "hardening." * lesion (LEE-zhun) is damaged tissue. Jean-Martin Charcot is known as the father of neurology, or the study of the nervous system. Charcot was born in Paris in 1825 and worked at the Salpêtrière Hospital his entire career. In 1868, a young woman came to his clinic with an unusual tremor and other neurological symptoms. The patient subsequently died, and in examining her brain, Charcot found the lesions * that we know today as the plaques caused by MS. Charcot treated patients with similar symptoms using electrical stimulation and strychnine (a nerve stimulant that also is used to poison rodents) in an effort to get the nerves working again. His treatments were unsuccessful, but in writing up the description of the disease and the changes in the brain it brings about, Charcot was the first to diagnose and to name MS. He laid the groundwork for future research, and his definition of the disease still holds today. It is not easy for a doctor to establish that a person has MS, because the symptoms are varied and not specific for the disease. Symptoms of MS can be confused with those that follow a viral infection or other diseases. A technique called magnetic resonance imaging, or MRI, is able to visualize the damage that MS causes in the brain. Another technique called magnetic resonance spectroscopy (spek-TROS-ko-pee) provides information about the biochemical changes caused in the brain by the disease. These methods, along with other laboratory tests and the typical course of repeated attacks, can help to confirm the diagnosis. At present there is no cure for MS, and no way to prevent it. Some people do well with no treatment at all. Heat can make the symptoms of MS worse, and swimming or a cool bath may help. Until recently, people suffering severe relapses of MS were offered steroids (drugs with anti-inflammatory properties) as treatment. Steroids can reduce the duration and severity of attacks in some patients, but how they work is not known. Unfortunately, they also can cause acne, weight gain, psychosis, (losing touch with reality), and other serious side effects. These drugs are not recommended for long-term use. 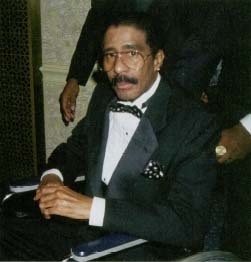 Richard Pryor at an awards ceremony organized by the Congress for Racial Equality. Many people with MS use wheelchairs and other aids to assist in their mobility. Since 1993, three medications—Betaseron, Copaxone, and Avonex—have been available to treat relapsing-remitting MS. These medications are based on several different forms of a naturally occurring antiviral protein called beta interferon. Interferon reduces the number of MS attacks and may slow the disease down; they also appear to prevent new damage to myelin. A person receives interferon as an injection. Although interferon treatment has side effects, they are much milder than those of steroids, and include flulike symptoms, depression, and mild reactions at the place where the person receives the shot. What Other Treatments Are under Investigation? Scientists are working on many new therapies to treat MS. For example, immunotherapy aims to enhance the body's own defense system to fight the disease. Because in MS the message, or electrical signal, that travels along a damaged nerve fiber is weak, researchers are studying ways of making the signals themselves stronger. Other research aims at finding ways of restoring the myelin sheath. Most people with MS can expect to live at least 25 years following their diagnosis. One-third of people with MS will have very mild symptoms and be able to lead relatively normal lives. However, for people who become seriously disabled, life expectancy may be significantly reduced. The diagnosis of MS is usually devastating because patients are often young adults. Suddenly plans for a career and family must take into account a disease whose course is uncertain. Yet many people with MS will continue to lead productive lives. A woman who has MS may still become pregnant and bear a child safely, although she may be instructed to discontinue her MS medications during pregnancy. And some of the physical limitations of the disease may make it more difficult for a mother with MS to care for her child. Children whose parents have severe MS may find it hard to accept the changes they see happening in a person they remember as having been able to do everything and whom they still depend upon. They may feel guilty enjoying things like bike rides that their parent can no longer enjoy, or they may get frustrated having to help with simple things like fetching a glass of water or turning the radio up. MS takes a tremendous emotional and financial toll on the entire family. Support groups and counseling may help MS patients, families, and friends to cope. Koplowitz, Zoe, and Mike Celizic. The Winning Spirit: Lessons Learned in Last Place. New York: Doubleday, 1997. "How Your Immune System Works." An introduction to the immune system.